214 Purchases in last 24 hours! Your child won't have to take a super soldier serum in order to become Captain America when they was have this Civil War Boys Captain America Costume to wear instead. Captain America has always been the most pure-hearted of the Avengers, and now he fights for what's right in the upcoming Civil War. 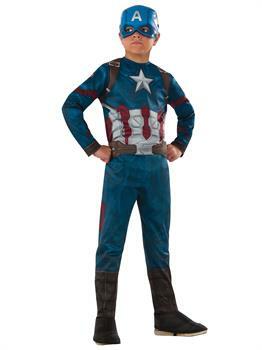 Show your support in this costume, which comes completely with the captain's famous red, white, and blue jumpsuit patterned to look like his armor, complete with the brown straps that are on his new Civil War uniform. Also included are attached brown boot toppers with a stirrup strap at the bottom of the boot to keep them straight. The costume also comes with a blue molded plastic half mask featuring Captain America's famous white A. Finish the look with a shield and you'll be protecting America in no time!. If you love Man Out of Time for his patriotism then Captain America costume is definitely for you. Show your Superhero love with Captain America outfit and get ready for real action. Captain America is an iconic legend who can sacrifice his own life instead of taking lives. You can’t thing of any boring theme outfit if you are shopping for your boy. Let him wander in his imaginations and dress up like one of his favorite character. Halloween fun begins with our costumes collection and your excitement starts with our Marvel's Captain America: Civil War - Captain America Child costume.